Gnome 3 is the next step in the evolution of the Gnome desktop environment and is a light desktop environment used in many popular Linux distributions. Here I'll show you how to install it on Ubuntu 11.04 Natty Narwhal. Attention! If you're doing this inside Unity, you'll break your session. I don't know of a way to revert this process, I did, and I recommend you do this inside Gnome 2 as well, I'm not in any way responsible for your mistakes. You've been warned! Again type your password if needed and hit ENTER. You will be asked if you want to upgrade your packages, type Y (yes) and hit ENTER. Type your password and hit ENTER. You'll be asked if you want to install gnome-shell, type Y and hit ENTER. You're done! Not as colorful as 'The most incredible and really unbelievable dream has become true: You compiled e17 successfully!' (Enlightement fan here ) but GNOME 3 is now installed in your Ubuntu machine. All you have to do now is to reboot your system and choose 'Gnome shell' at the the login screen. And this is how it looks, enjoy it! A few months ago i upgraded the ram to 2 Gb and got a 100 Gb hard drive before upgrading to 10.10 'Maverick' and just a couple of weeks ago i upgraded the same notebook to Ubuntu 11.10 'Oneiric Ocelot' which is running perfect. One thing i don't like from the latest Ubuntu releases is the Unity interface, it feels like a huge smart phone and i just couldn't work comfortably with it, so i kept using Gnome 2 and waited (un)patiently for Gnome 3 to be released. When i upgraded to 11.04 i read with great pleasure that Gnome 3 was released so i happily made the necessary arrangements to upgrade to this long awaited release. Gnome 3 is great, it's interface is a bit like Unity but you find your way around much faster... at least i do. Coming to think of it, if Gnome 3 looks and works as good or even better than Unity, why didn't Canonical stick with Gnome and saved themselves the whole work of developing Unity? While running on 11.04 Gnome 3 was lacking a bit of performance but after upgrading to 11.10 it's performance improved a lot and G3's interface is very pleasant and user friendly, if you still want to customize Gnome 3 beyond what configuration editor allows you'll need the Gnome Tweak Tool to do so. Yesterday while checking settings on my laptop i accidentally switched the wireless lan off -Stupid me- i thought, but as i tried to switch it back on it didn't work! Wtf??? was my first thought, i clicked on the enable button but nothing happened, i also notice that the 'Airplane mode' button was enabled, so i switch that one off and tried the wlan again button without success. 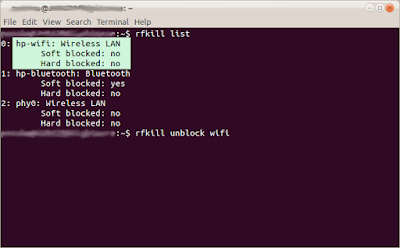 To check if wireless is blocked, we use the 'rfkill list' command, in my case, '0: hp-wifi' is the interesting part of the output. 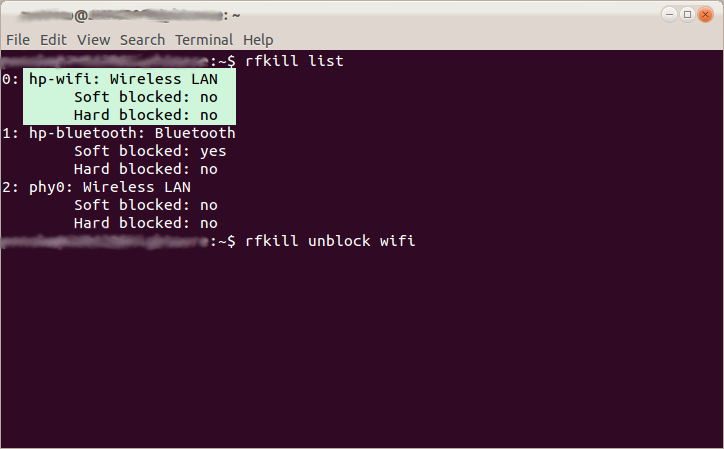 When wireless was blocked it showed 'Soft blocked: yes' (sorry, screenshot was made after everything was fixed) in order to unblock it enter the next command 'rfkill unblock wifi'.